By enlarging the image, you can quickly see the difference in pixelation of and around the hand. Clearly, the hand has been altered, probably added from another image. Side by side comparison of the pope’s right and left hand. Righ hand being the left image and the left hand being the right image. 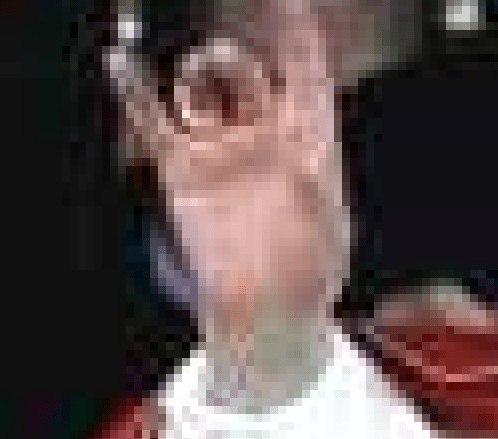 Close up of the Pope’s left hand. 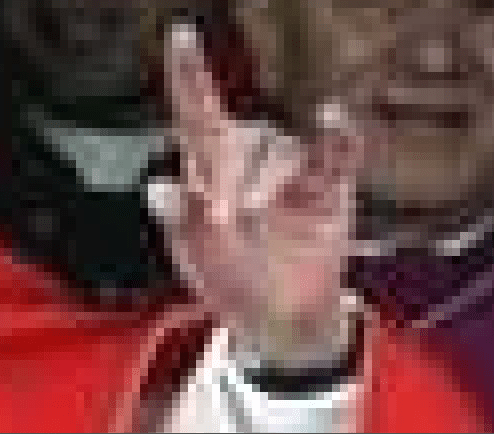 Close up of the Pope’s right hand. This is the image that gives it away, the clear “blurring of the wrist area and all around the hand. Also notice the dark grey/black areas on either side of the hand, clear manipulation of this image. 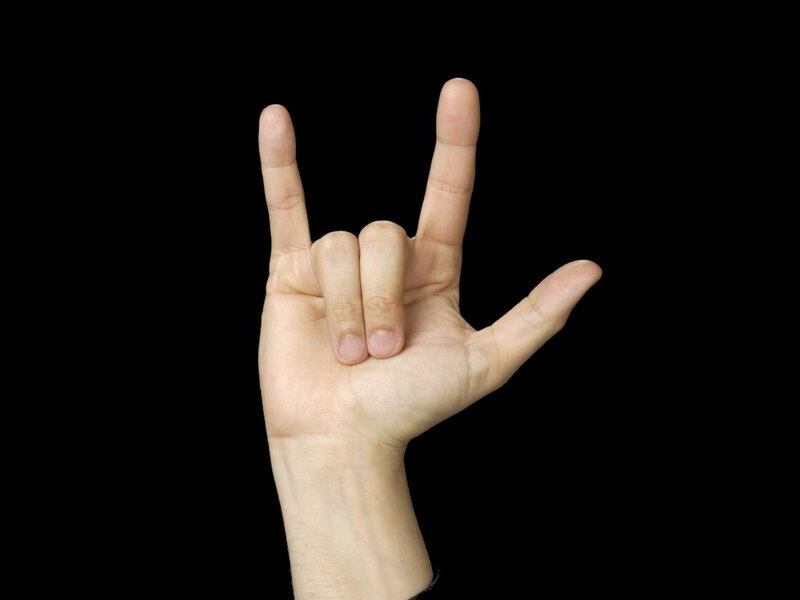 The problem is that people do not know the difference between the sign language form of “I Love You” and the Devil’s Horns sign. 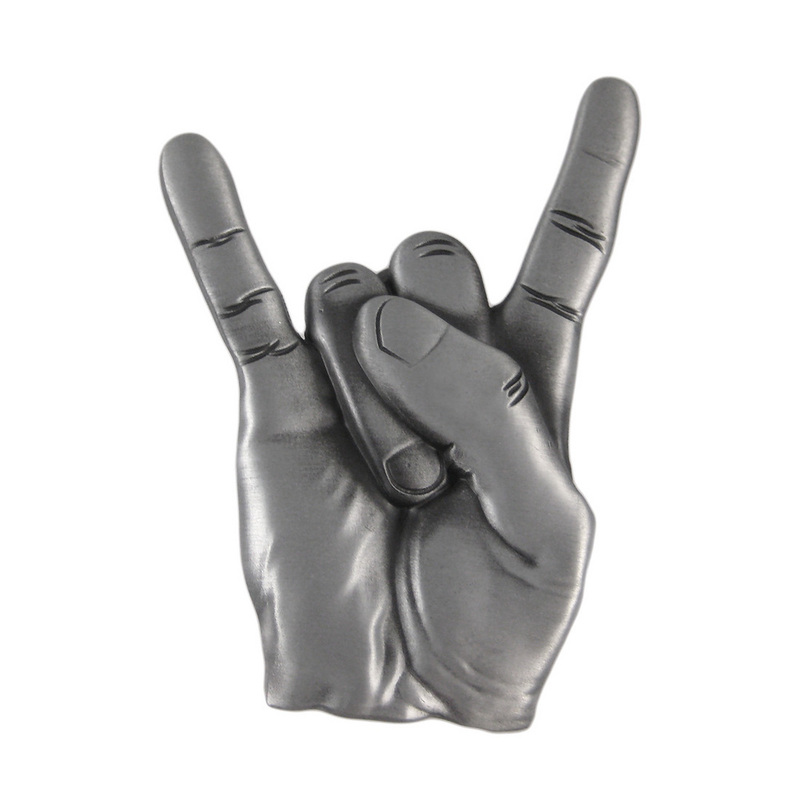 Below are the two, notice that the distinct difference is the thumb holding down one or two of the middle fingers. The “I Love You” in Sign Language. Tagged: Catholic, Devil horns, Pope, Pope Benedict. I have examined this photo. This image has been altered. The hand in question has been created through a cut and paste method. I have taken a copy of this posted picture and examined it. i have a photo of my results to back up my statement. Unfortunately there is no place to post it here. It has at least two implants. My examination is sufficient enough for me. However I can break it down further to know how it was done. I cannot of course take it to the original hand. I have done enough to satisfy my curiosity. This is a false image. as a jesuit priest for 38 years -the Holy see revealed to me that Pope Francis is indeed the false prophet of the book of revelations – Peter the roman-Satans own false servant upon the earth–So, if you think that false religion and demonic ritualistic eucharist is Holy?? ?you must think agin!! 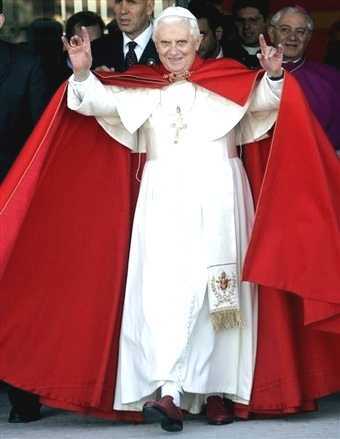 expect the antichrist and the beloved pontiff to be together soon on the world political / religious scene to decieve the world leaders and to divide jerusalem–Remeber that a beast, is a bneast, is a beast–satan is the lie and the false religion that the catholic clergy push-is a lie! !so, serve satan or serve the King of Kings JESUS!! Two things… one, I suggest you edit your post, it is incoherent. Second, What Church do you belong to? Hello Lionel, you are correct…that is the summary of my post, a clearly altered photo. If you wish, you can send me a contact message via my contact form and I will respond to you, you can then email me what other evidence you have and I will add it to the post. It is his watch. If you look at other photos of him you will see he wears a watch with a black strap and metal buckle. If you are Catholic. You are deceived. Make sure you follow the word of God because if you don’t Endless torment awaits you. That’s the simple reality. First; “The most powerful telescope in the world belongs to the Vatican and it is called “Lucifer” this is a myth…please due a little research. Yes, I am a Catholic… Let me ask you a question Levi, what is the Word of God? I would advise you to research the Jesuit Order, Jesuit General (Pope) and the Knights of Malta. Research it thoroughly. Try to understand why there is an obelisk in st Peters square. I use to be Muslim until I could not deny the truth anymore. If God commandments tell you to NOT do something, Then you have one religion saying this and that is ok, Another religion saying oh and this is fine too, And another making a tradition out of something you are commanded not to do. You begin to see which one really is the word of God when it is left on one side saying don;t do this. and the rest on the other side allowing you to do those same things. Like a bad in the school who gets you in trouble. Let me give you a few hints, Please give them some thought for your own salvation. Thou shalt not make unto thee any graven image/Idol worship = Catholics, Cathedrals are built on grave sites, with bones beneath the alter in a downstairs room (Visit a cathedral or google it) And Idol worship is absolutely everywhere, Statues of Marry, Jesus, Etc. Thou shalt not bow down thyself to them, nor serve them = Catholics, Pray to SAINTS. This is just wrong. JESUS is the only mediator to God, Not Marry, and not any Saints. JESUS alone and that’s that. He was the Messiah sent to earth, God manifest in Flesh, Divine Spirit, Sinless, Perfect. He is the Mediator. Not some saint. And PAYING MONEY FOR A BLESSING ? MONEY!?!?! Think long and hard. becuase this is not WHO is right and who is wrong, Religon verses Religion, Its about are you saved or not?. Thats what it comes down to. Levi, You did not answer my question…but I forgive you. The answer I was looking for is “Jesus, is the WORD of God, the Bible is the written word of God”. Now, knowing you are a recent convert, I again will be gentle with you, for I am sure that you have been taught many erroneous things, and to be perfectly honest, as I was as well most of my life. So I am going to give a few things to ponder and research, a homework assignment if you will. The first thing I want you to think about is this question; What did Jesus Establish on earth, a book or a Church? Then, following those thoughts, where did the Bible Come from, what does the word “bible” mean away? And continuing on, how did the scriptures survive for 1500 years before the printing press? The second thing I want you to research is Why are you a Protestant, did you bother to look at both sides of the argument from “the horses’ mouth” if you will? Do you realize or understand that Protestantism is founded mostly on a heretical priest from the Catholic Church? Oh, and by the way, every single church out there was started by an individual, who started the Catholic Church? Now, under no circumstances should you look to the Catholic Church that you see now and assume that is the Catholic Church that has always been. If you go back 20 years, that is not the Catholic Church. If you go back 40 years, that is not the Catholic Church. If you go back 60 years, you would see what the Catholic Church was, all that remains is a remnant. As a former Muslim, I am sure you are familiar with the name Fatima, the youngest daughters of Muḥammad. In that video, it will explain what transpired in 1917, in the town of Fatima, Portugal, I think you will find it interesting. I spent countless hours researching the bible “streams” if that’s the correct way to put it, Tracing back to where they came from and which manuscripts they are based on. I feel pretty comfortable with the Textus Receptus because it is aka the majority text, 5000+ manuscripts in 95% agreement for instance. Whereas the Codex Siniaticus & Codex Vatican’s have numerous problems and miss alignments in scripture. This implies corruption or attempted corruption. I am not comfortable with my bible being based on Alexandrian Manuscripts. I pagan region if I’m not wrong. If you would like to do some research, look into Westcott and Hort. Look at their beliefs. They based their bible translations on the corrupted manuscripts Siniaticus & Vatican’s. Also, Listen to the chanting in the Catholic Church, word for word, and translate it from Latin to English. I won’t comment on this. I could be wrong. But do have a look at that. Didn’t the Catholic church have William Tyndale executed for making an English translation of the Textus receptus available? I believe so. And can you please tell me how Martin Luther was a Heretic? He went to Rome, and seen what how the Catholic Church operates. Taking money for blessing was one of the problems he couldn’t get his mind around. Visiting towns and taking money from people as blessing for those who passed away. It was a great business indeed. Martin Luther however recognized this was a problem and people needed to know Jesus Christ as the fist most important thing, And to have a repentant heart. Instead of “paying the catholic church” for forgiveness. That makes no sense. You can’t buy your way to salvation nor can you buy salvation for those who passed away. But this was the idea the Catholic Church was selling to people and the Protestant reformation grew. The Textus receptus was translations. Many have been prosecuted because of it. And today the prosecution has evolved into deception. I do not mean to offend any Catholics here. I only wish to lead people to salvation. Levi, your enthusiasm is admirable, but you have been told lies and you believed them… To prove my point, let me ask you a question, which Gospel has the account of Jesus giving the Apostles the ability to read minds? Please, Before I begin to respond to your questions, Do you accept the fact that its ok for man (a pope) to forgive you for your sins instead of God himself? Where does the Bible give Men the right to forgive eachother leaving God out of the equation all together ? I’m sorry but that makes no sense to me.